One man's bandit is another man's champion in Jahmil X.T. Qubeka's visionary account of Xhosa rebel John Kepe at dawn of Apartheid. With Sew The Winter To My Skin, writer director Jahmil X.T. Qubeka has quietly - the film has very sparse dialogue - yet audaciously - it also boasts some extraordinary visceral imagery - established his place among the best filmmakers of the New South Africa generation. Having only just premiered at the Toronto International Film Festival, South Africa has already selected the film for Oscar submission to the Best Foreign Language Film category. It should be a serious contender. The film is based on the true story of John Kepe; a Xhosa outlaw of some notoriety or a native Robin Hood of some popularity, depending on your perspective. Kepe pillaged sheep from the flocks of white farmers, among other items, and evaded capture for the better part of two decades, from the 1930s to 1950s. This was an eerie period during which political power in South Africa shifted from British colonial rule to Afrikaner nationalist policies, culminating in the racist tragedies of Apartheid. As a period piece, the films offers an immersive historical window into life during the wax of Apartheid, yet it is clearly also a mirror for contemporary South Africa. The film stirs rich contemplation of the country's ongoing tribulations, many of which we see the seeds of in Kepe's time. Qubeka's critical creative choice is the rejection of dialogue driven plot, and the result I'm pleased to report is not a slow and silent contemplation, but an energetically enigmatic masterpiece of visual storytelling. The sparse dialogue leaves room for every character to fill their moments, and even lesser roles are imbued with the gravitas of careful and unhurried attention. His last feature was 2013's Of Good Report, another extraordinary film that caused such a furor it was banned, and about which I wrote extensively. Sew The Winter To My Skin is a more mature film, and more ambitious in scope, but brimming with the same fiery spirit, pulling no punches. For instance, this is the first film I've seen that explicitly invokes a connection between the origins of Apartheid and the South African Nazi movement, whose flag and regalia are seen adorning a room of military memorabilia preciously curated by the film's antagonist, a military veteran and now sheep farmer called Botha. Kepe is no easy hero though; his actions and choices leave him largely estranged from his wife, bring tragedy to his household, and eventually result in a self-abasement so horrifying and symbolically searing that the memory lingers with a foul stench long after the film. He is as much a cautionary tale as invitation to rebel. Ezra Mabengeza shines in the leading role of Kepe, in what appears to be his first feature film in front of the camera. Brenda Ngxoli plays his wife with nary a smile nor a word all film, delivering a desperate performance as she's left alone and vulnerable by her husband's choices. Botha is played with venomously droll condenscenion by Peter Kurth, but the cruelest villain is his native lawman/henchman, Black Wyatt Earp, mustachioed with the same iconic and enchanting effect as Christof Waltz's pipe in Inglorious Basterds, and brought to loathsome life by Zolisa Xaluva. He's a survivor who embraces the modest opportunities provided by his oppressors, but who in doing so has adopted the worst of their sadistic indifference. He's a vile caricature of his villainous masters, and probably the most hated man in South Africa after any given screening. Supporting acting is universally outstanding, a necessary standard for a film of few words. The cast includes some Canadian-South African talent (Kandyse McClure), straight up Canadian talent (Dave Walpole) talent, and well-known local talent like Bok van Blerk (Moddern En Bloed), Bongile Mantsai (who soared in last year's The Wound), and veteran Nomhle Nkonyeni as the old matriarch (Of Good Report). There are many bold images in this film, and some of them are truly unprecedented. But for all the visual panache, to say nothing of the quality acting and craftsmanship at essentially every level of this production, it's the film's insistent disruption of comfortable perspectives that gives it such soul. When a throng attacks a villain in his home, there is no easy retribution - we hear his wailing children and family. When a racist farmer fails to save his farm, there is no easy satisfaction - this is when we see his only display of tenderness in a sweet moment of marital solidarity. Again and again, Qubeka forces us to acknowledge our tribal allegiances, and animosities, and to question what our interpretations mean for ourselves and the greater truth. 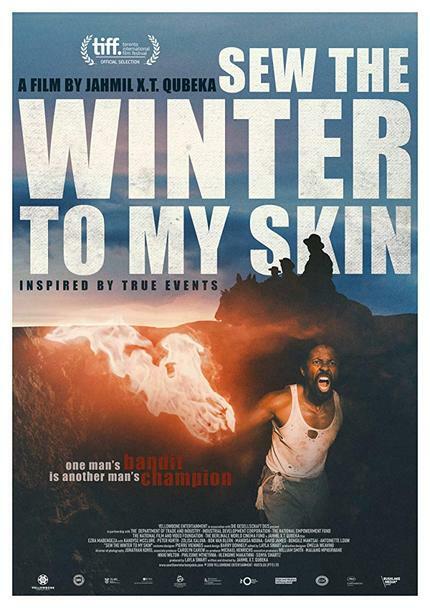 Sew The Winter To My Skin is a timely historical reflection with profound contemporary reverberations for South Africa, but this local tale of tribal perspectives has a powerful global resonance in the current socio-political climate across so much of the world. At this time in the world we could use more films that elect not to strip their villains of their humanity, nor elevate their heroes above their flaws, and in so doing compel us to ask penetrating questions about our preconceptions. Expect to see this film firing on the festival circuit, and perhaps even on the Oscar ballot in 2019.